medicines for the cures of our diseases. moving the air, has banished diseases. when the sun was gone. witches and reptiles, and has given to us his rain. the earth with a beneficient eye. directs all things for the good of his children. 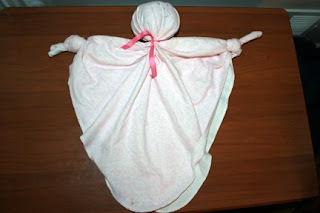 I have been looking for a simple baby doll pattern to make for my daughter for Christmas or birthday, and have yet to find what I'm looking for. Simplicity has a baby doll pattern that also has patterns for a doll diaper! Abigail has been changing her baby's diaper the past few weeks as a prelude to changing her own diapers, so I thought actual diapers for her baby would be great. Since I haven't been able to find a doll pattern I like, I started looking for online patterns for diapers to put on our existing doll (a gift from her cousins' other grandmother). I found this simple looking pattern at Skip to My Lou. I need simple, because I'm not even sure I can run the sewing machine properly. Our city just got our first JoAnn's store last week, and I've been looking through the Simplicity pattern books looking for a prairie doll pattern that my mama and grandma used when I was little. I've only been able to find one doll pattern (a baby doll) in the Simplicity book, but my JoAnn's doesn't have that pattern in stock yet. Have you found a simple baby doll pattern that you like to use? I'm still considering ordering the Waldorf kit from Weir Dolls & Crafts. Since I was pregnant two years ago, I have wanted a mei tai baby carrier. I couldn't find one locally, and really wanted to try it on before buying one. I ended up with a Maya Wrap, and while I enjoy using it, at times I still pine for that mei tai I never got. I've heard of a lot of people making their own baby carriers, but sewing seemed so complicated. Thanks to the angry chicken and Bend the Rules Sewing, I'm now finding that sewing is simple and satisfying. So, even though my munchkin will be two soon, I'm considering making that mai tei now. She still likes to be carried, and who knows what the future may hold? I have found several tutorials and sets of instructions for Mei tais online. Here are a few that I think I will use to make my own. The FrankenKozy at "Jan Andrea at home" looks comfortable and has lots of photos in the instructions, although the pleats look comlicated. These instructions at "Jan Andrea at home" seem easier to follow to me. Maybe it the "no pattern, just cut rectangles" approach. The mei tai at this site has an interchangable panel so you can change the overall look of your carrier. I love the Asian-fabric on some mei tais, but am concerned about keeping them nice, so this may be the way I go. And finally, if you're interested in making your own baby carrier, but you would prefer something other than a mei tai, this site has lots of links to instructions for making all sorts of baby carriers. I enjoy carrying my now-toddler, although we haven't done it as much as I expected we would. I've actually gone months at times without picking up my sling (although, I know it would come in handy on nearly every shopping trip when she begs to be held instead of riding in the buggy). I know there are times when it's very helpful to be hands-free when I'm carrying her and the stroller is often not practical. I like to have my stroller for trips to the zoo, but it's hard for little ones to see unless they're being held. My stroller is very useful for holding my purse and lunch! Did you use a baby carrier? What was your favorite? Have you ever thought of making your own carrier? 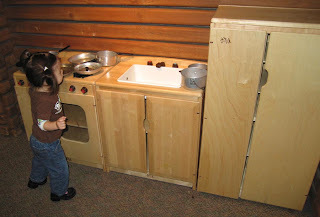 These are photos of the kitchen set Abigail played with at the Chicago Children's Museum. I would love to have a set like this! Christmas will soon be here, and I'm trying to plan not only what we want to get Abigail, but also what to tell the grandparents and Santa should they ask (my Mama already has and I hear Santa takes letters). Abigail will be 2 in January, so I'm also looking ahead to her birthday but also thinking about the sorts of things I would like to gift her with in the next few years (while I still have a say in the matter). So here is my thinking-out-loud idea list for gifts I would like to buy or make. play silks - I've been looking at these at various on-line sites for several months. They're terribly expensive and I don't really know what makes them better than the huge pile of baby blankets I have from my baby showers. However, I'm willing to give them a try. I can't remember where I found this, but you can buy plain ones here and dye them with koolaid or food coloring. It's so much cheaper this way and then it becomes a craft too. I've looked at several fabric stores and you just can't buy this much silk this inexpensively locally (not that I've discovered in my city anyway). I do have some silk remnants from a sari store in Alanta that I bought years and years ago and I know Abigail likes playing with them, so I think she would be interested. homemade wooden blocks - I think I've mentioned these before on this blog. They look great, but they're so expensive. I was convinced my brother could make these easily, and I was right. I happened to park next to my daddy's woodpile when I was there in October and found the perfect logs. Andy cut them for me into various thicknesses, and now I just need to coat and/or sand them. Abigail has already seen them, knew they were blocks and started playing immediately. (They briefly showed up on our seasonal "table" on our front porch.) Andy tells me ours are made from pecan, persimmon and water oak. handmade baby doll afghan - I am not good with the crochet, but I did manage a very small afghan for one of Abigail's babies. It is more of a lap blanket for a 9 inch doll, but I tried. Eventually, I might work up the nerve to make one for a larger doll. handmade afghan - I started this afghan several weeks ago and thought I was almost finished. Then I realized the darn thing looked like a cone instead of a rectangle. So I quit in frustration. It was supposed to match the doll afghan (or vice versa) but so far it's stuck. I might try again for her birthday. handmade baby doll - I really like the idea behind the Waldorf dolls, with their cloth bodies and wool interiors. I don't sew well, so I'm pretty intimidated. I've been looking for a pattern that my Mama and Grandma used to make prairie dolls with (my Laura Ingalls Wilder doll), but Simplicity apparently doesn't make it anymore. I'm thinking about ordering a kit from Weir or Magic Cabin that contains everything I'd need to make a Waldorf doll (except skill). handmade felt play food - I've mentioned this several times here. I've fallen into a whole debate on whether I should use acrylic felt or wool felt or if it's irrelevant because she puts it ALL in her mouth anyway and it would get gross. Should I just buy her some wooden food? Should I just stop worrying about the plastic food she already has? Should I wait until she's old enough to pretend to eat it instead of actually chomping on it because she thinks that's how you pretend to eat? In the meantime, she's still actively chewing on plastic food that I'm not sure of the provenance. And today I got the Pottery Barn Kids catalog with a too cute chinese take-out set made of fabric. Love it! tea set - I'm looking for a non-plastic, non-ceramic useable tea set. Abigail likes to actually drink out of her play cups, so I think she would like to actually pour from her tea pot. I'd love one made of teak or something, but I've found two I like, sort of. The Pottery Barn Kids set is perfect - it's painted metal, it includes plates, saucers, spoons, creamer and sugar. It's durable for toddlers but pretty for older children too. Problems: it's pink and I'm growing tired of pink and it's $70. I really don't think we need to spend $70 on a tea set. The other set I like is made by Green Toys and is made in the United States of recycled milk jugs. So it's durable, attractive, eco-friendly, affordable, and made in USA. Cookware and Dining Set - I would like Abigail to have a little aluminum set of cookware. I like durable things because they hold their value if we decide to resell but can also be handed down if we don't. I'm actually considering checking a thrift shop and seeing if I can find a lightweight pot and pan in a small size. I also like the cookware set from Green Toys, but at $40 it's considerably more than the tea set. rocks - It sounds silly, but I think I would have loved a huge bag of decorative rocks like they sell at Home Depot or Lowe's. When Abigail is older, I think it would be fun for her to wash them off herself and play with, arrange them, sort them, whatever. For now, I picked up a small bag of already clean rocks from Hobby Lobby when they were 50% off. I think she'll love them. I just have to make sure they stay out of her mouth. Curious George dvd - We have the soundtrack by Jack Johnson and listen to it all the time. I've seen the movie and I think it's calm and gentle and that she'll enjoy it. Abigail will be 2 in January, so we'll start letting her watch more tv (she doesn't officially watch tv now, although we have our own shows on at times). Curious George book and stuffed animal - The last time I checked, Kohl's had Curious George as their $5 charity special right now. We are thinking about getting her a book and the character. stainless steel mug and insulated bowl - We saw these at some baby store in Chicago and we're thinking about getting them for her. The bowl would allow me to pack spaghetti for our trips out during the day when I know she won't share my sandwich (she doesn't care for bread). And we are considering stainless steel over plastic sippies. crayon roll - I've seen these on various blogs and actually at one local store. They seem to be a great way to keep the crayons contained. I've also seen one in a catalog that also contained a sketchpad. Abigail has a very large sketchpad, but a smaller one would be nice when we're in a restaurant or something. She's really too young for coloring sheets. matching games - I've seen some really imaginative matching game ideas at Chasing Cheerios. I'm thinking of making one involving family photos. We could match the photos or just name family members. And animal set could be really useful too. diaper bag with cloth diapers - I'm not sure how to go about making cloth diapers, but I see no reason for her to have disposables for play (we do use disposables on her). 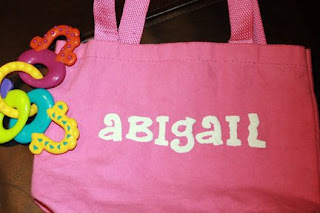 Abigail is very much into purses and bags, and I think would enjoy having a bag especially for her baby. I thought this was cute to base the idea on, but I'm not planning to buy this one. She could also use a new purse, since hers is falling apart and she keeps trying to steal some of mine. play clothes - I would eventually like Abigail to have dress-up clothes and a place to store them, either a trunk or a Waldorf rack-thing. I'll probably throw in some of my old prom dresses and shoes. As it is, she has a really cool terry-cloth kitten costume (looks like it was made out of a towel, but was purchased premade - it has a store tag) and a few Halloween costumes. Kitchen set - This is the biggie for me. I would like Abigail to have a well-made wooden kitchen set that includes a sink and stove and storage area, a fridge and/or a pantry. I had a wonderful metal set when I was about her age, but I remember it being crushed at some point. She has a plastic set right now but I think the set up is a little chaotic. Nice wooden sets are extremely expensive. I like this one, and this one. I also like this refrigerator. I would love to be able to make these myself or talk someone close into making it. I like the very simple look. I'm just not sure where to find plans to make something like this. The sink looks to be a challenge. Table and chairs - While we do have plastic tables and chairs, I think it would be nice to eventually have a nice wooden table and chairs. I'm looking into a mission style at the unfinished wood store. In Georgia the unfinished wood is mostly pine and aspen and completely affordable. In Kentucky, I've only been able to find oak and other expensive wood. Heavy, warm baby doll - I found this doll earlier this week and I'm wondering if it would be helpful for Abigail to snuggle while sleeping. Again, it's not cheap, but I'm not sure how I would make one of these. I realize this is a long and imaginative list. I'm not expecting to get everything on this list this year by any means, but I would like to get her some of these things over time. I am not familiar with the show Donna's Day or with Donna Erickson. I found the book Donna's Day: Fun Activities to Bring the Family Together when I was searching for craft books for parents with young children. This book had some of the coolest ideas in it, and a lot of them were things I hadn't seen before. So many of the crafty books I find have the same ideas over and over with slightly different instructions and photos, and some of these crafts are the same as elsewhere. I think some of these crafts are just things that parents have done with their kids for years, and the authors feel like they can't be left out. This book doesn't have a lot of photographs, instead using illustrations of the steps and completed projects. Unfortunately, the copy I checked out of the library seems to be out of print (but maybe available from individual sellers), but Donna Erickson has several other craft books for families that are available on amazon, including Donna Erickson's Fabulous Funstuff for Families: 100s of the best award-winning activities, games, and crafts from Donna's Prime Time books and TV show. For my own benefit, I made a list of the projects that appealed to me most, and I'm listing them here by chapter with the page numbers. I'll give a description if I feel it's necessary. You might want to check your local library or bookstore for this out-of-print copy or another of Donna Erickson's books. I learned about this while looking at the press release from Toys R Us on 2008's expected toy trends. I googled it and all I've found is a book that was released in 2003, so either Toys R Us is behind or I'm lost. This wonderful arts and crafts resource explains ways that kids can make paints and inks from flowers and other plants, and much more. I think teaching kids how to make their own paint from nature is totally cool. You can read the rest of the press release here. I don't like to get political on my blog, but I wanted to get this off my chest. Marco Allen Chapman is scheduled to die by lethal injection tonight in Kentucky. I remember the crime he confessed to committing. It was horrifying. He raped a mother, attempted to stab her to death, then stabbed her 3 children, killing two of them. The mother and 3rd child struggled for their lives. Chapman was caught soon after and has been asking for the death penalty since his arrest. I have conflicting feelings toward the death penalty. Mostly, I'm concerned that there are people who have been on death row for many years and were later found to be innocent of the crimes they were convicted of. The death penalty is final, and can't be taken back. That concerns me in a free society. Tonight, though, I'm sickened by the thought that Chapman is having banana cream pie, among other things, for his final meal. A meal he was allowed to choose, after he has asked to be put to death for a crime he admits to committing. And two children are dead because of him. We had snow unexpectedly last night, and it made us want chili. The problem is that you can't make chili at 6pm and expect to eat at a decent time. So I'm making slow chili today (we have fast chili, too, but it still takes over an hour). I started cooking around 1pm, and I expect we'll have dinner around 6pm. I'm a little apprehensive about this batch. It's been a bit of an ordeal. I started at 12:30pm by not remembering what we usually put in chili. I don't seem to have a written recipe. I thought I'd blogged about it, but did a search and only found a vague list of ingredients. So, I hope that it even tastes right when dinnertime gets here. My first step was to complain about how much I hate cooking meat, and then to call my hubby and complain that he didn't cook it for me last night. He apologized, and said to make the chili and we'll add the meat when he gets home. Yea! I hate cooking meat, especially ground meat and especially with a toddler underfoot (for the record, we use Laura's lean ground beef - 8% fat this time). Next I sauted the onions. I thought I'd use a little canola oil, but I poured too much. So I soaked up some of the oil, and them over-browned the onions (not burned - I hope). Added a little chopped fresh garlic (one clove). Added can of dark red kidney beans after draining and rinsing them of the high fructose corn syrup. It must be dark red for me. I like the color contrast. Added a can of Rotel and can of organic diced tomatoes (same price as regular this time). Wondered why I don't can my own tomatoes for chili, soup and spaghetti since we have SO many tomatoes each summer. Added a large can of crushed tomatoes, and immediated recognized it as a mistake. Too much tomato, and too mushy. Hope no one notices. Added a packet of Chili-O seasoning. Added Chili powder. Added cumin, a little extra because of the massive quantity of tomatoes. Cumin smells icky to me, but I can acknowledge that it does help the flavor of chili. Added secret ingredients of cocoa and cinnamon. Hubby insists this makes it Cincinnati chili which I thought required spaghetti. I'm a Southern girl, and don't believe I'm making Cincinnati chili since I'm using spices native to South America, but whatever. Let the chili simmer while playing with Abigail and then remembered I should stir it. Oops. I haven't tried the chili yet. I'm a little afraid to ladle any out, not only because I'm holding a sleeping toddler. Now I just need to check our supply of bread, peanut butter and saltines. I'm a fan of Premium brand crackers and oyster crackers as long as they're NOT stale. Hubby likes to accompany his chili with peanut butter bread. Abigail just likes to eat the same thing Mommy and Daddy do. One of the fun things we did in Chicago is go to Trader Joe's. I knew it was a grocery store because I'd seen it on Ellen and Good Eats, but we don't have one in Kentucky. I was pretty impressed with it. It's like a smaller Whole Foods. Most of their products seemed to be Trader Joe branded. They didn't have bulk foods, which I had kind of expected. I really liked that there didn't seem to be any out-of-season fruit (like blueberries from Chile), mostly apples and citrus. Summer berries in groceries during the winter drives me nuts, especially in stores that I expect to support things like organic living and local eating (or at least not promote extreme 10,000 mile diets). By far our favorite find in Trader Joe's was the cookies. My mom and I found Candy Cane Joe-Joes. They look like oreos, but the filling contains crushed candy canes. We bought one box thinking that nothing oreo-like is as good as oreos, but they were the same price. When we got to the car, we each ate one. My mom turned to me, and said "Go buy two more boxes." They taste like a creamy thin mint (Girl Scout cookies rock, too), and are soooo yummy. So, if you have a Trader Joe's, I recommend you check out these cookies. If you don't have a Trader Joe's, I am so sorry. The cookies are seasonal (funny how it's ok for cookies and candy to be seasonal, but fruit and veggies can't be), but our clerk assured us that they freeze well. We got to take a mini-vacation to Chicago last week, and got home last night. My husband had work to do Tuesday - Friday, and was gracious enough to not only take our daughter and me, but also invited my mom to join us! We all had a wonderful time exploring the city (my 3rd time in Chicago), and eating our way around the city. I hope to be able to do a few posts about the great things for kids to do in Chicago, but tonight I wanted to share some general thoughts. Traffic - I'm from Georgia, and while I grew up south of Atlanta, I did spend 5 years living in the city, and another year commuting. Atlanta traffic is rough. When I was commuting, on a bad day I was in my car for up to four hours. As much as I loved my job, the traffic in Atlanta (and the cost of living near my office) had me looking for a new job within a year. All that said, I've learned that I'm very glad I don't live and drive in Chicago on a daily basis. In Atlanta, rush hour ends around 9am and starts up again around 3:30-4pm. On the interstate, there is likely to be a few miles of bumper to bumper gridlock during those times. Unless there's a wreck or construction, you're pretty much ok to get through the city at other times of the day (I've been away 9 years, but on my visits home, this still seems to hold true). In Chicago, I didn't really notice a rush hour. At 8pm, the bumper to bumper wasn't that bad. We only sat in traffic about 20 minutes then. Any other time of day I tried to get anywhere, I had to count on it taking me about an hour and a half to get anywhere, regardless of how far away it was. GPS - I am so thankful for GPS devices!! I think I would still be looking for Navy Pier if I hadn't had a GPS, and that's including the many times it lost signal due to the skyscrapers surrounding my car. I am confident in my map reading skills, but not so confident in the engineers who designed interstates that weave and criss-cross without much warning. Street names - While I can understand the reason that one would want a street name to stay the same for the entire length of the street, I found it confusing that the same street name could be found for miles. Give me Peachtree Street-Peachtree Road-Peachtree Industrial Blvd anyday. At least you know what part of town you're in based on the street name! Fellow Georgians, don't feel insecure about this "flaw" in our city design anymore! Food - I love food in Chicago. Specifially Italian Beef sandwiches. My father-in-law is from Chicago, and my mother-in-law learned (and taught my husband) to make a mean Italian beef. I'm so lucky to have learned about this delicacy years before going to Chicago. Now I know to tour the city trying and rating different sandwiches. My favorite this trip was Aurelio's. The meat is sliced so thin, and I think it's on a french loaf (which sounds weird for an Italian sandwich, I know, but trust me it's much better). We also ate pizza every day we were there, but I'm a thin crust girl, so there wasn't a lot of Chicago-style pizza in our experience. All in all, we had a wonderful trip. I really enjoyed having a car and going and doing whatever I got it into my head to do. It was really like being at home, only we were in a hotel and had a strange car and had to let the GPS guide us everywhere. It was great looking for new and exciting experiences that would delight a toddler, and I hope to share them all here over the next few days. I loved collecting rocks when I was a kid. I wasn't especially particular about what kind of rocks they were. I liked pretty ones, which sometimes even included the granite gravel that is so common in Georgia. I constantly has pockets filled with rocks, and I lined the windowsill in my bedroom with rocks I'd picked up on vacation and around our yard. So I find it amusing that my daughter is a rock collector. She's not particular either. She picks up rocks from our driveway, from other people's walkways, from any place she finds them. She doesn't realize that pockets make great places to stash things yet, but she has stuck rocks in her toy tote bag when I wasn't looking. Our newest fun activity this week was taking a bucket into our front yard and collecting the rocks that the construction crew left there after building our house. When our bucket is heavy, we use the rocks to fill in the mudholes in our driveway. Abigail seems to enjoy collecting the rocks and spending the time with Mommy doing exactly what she wants to do. Several times when we were engaged in another activity (reading, eating our snack on the porch), she has grabbed her bucket and my hand and exclaimed "Rock!" I've noticed, though, that she's now dumping her bucket in random spots in the yard and spending more time collecting dirt than rocks. All the same, I think my idea for a "chore" was on target. I checked the book Einstein Never Used Flashcards out of the library a while back and never got around to reading it. It's due back today, and I finally picked it up last night to thumb through and now I don't want to return it! It reinforces my philosophy that childhood is journey, not a race and that kids learn best through play. I'll give a brief outline in case anyone wants to check it out (and so I remember to go back later). Each chapter is broken into 3 part: Teachable Moments, showing everyday experiences as learning experiences; Discovering Hidden Skills, which describes how parents can recreate the experiments the authors used to illustrate their points; and Bringing the Lessons Home, which is concrete suggestions for things parents CAN do to help their children learn. Hint: signing them up for tons of enrichment cources and using flashcards are not the best way. Bringing the Lessons Home is the part I'm most intrigued with. I know this book is based on extensive research and I do plan to go back and read the whole book. I know from what I've read already, though, that I agree with the basic premise: children learn better when they are allowed to be children and learn at their own pace rather than be pushed into learning faster, quicker, better. learning in context is better than memorization - no flash cards! kids learn better by interacting with us than by watching tv - I've never really used the Baby Einstein videos we have and it's ok! play with your child - not just board games - join in with the imaginitive play. This is something I think we all struggle with, because we think we have more important things to do. Provide the resources for stimulating play. expensive electonic toys that do all the playing themselves are NOT stimulating. Ok. Time to go play with my own munchkin and return this book. I was tagged by Monica of Without Filters. I've never been tagged before, so I'm excited. It's nice to be thought of! 6. Let the tagger know when your entry is up! I think Halloween may be my very favorite holiday. I love the costumes, the candy, and coming up with ideas for celebrations. Fall is my favorite season, and I love that there's such a fun holiday in the middle of it. I love waffles. I like the little divits. I think they hold syrup so very well. I'm a big fan of maple. I'm willing to try others, but I need a little maple on the side. I love the 90's. Not in an ironic-cool, VH1 sort of way, but more in a does-she-remember what-year-it-is sort of way. I loved the flannel shirts, and wide belts, and baby doll dresses, and doc martens, and tights for grown women (I still have them and would wear them if they fit). I loved the grunge music. I was more a Pearl Jam girl than Nirvana, but I still respect the genre-busting. I still wear scrunchies (when I have long hair). I was convinved the 90's weren't over until it hit me the current decade is almost over. Maybe it's a love for the decade of your 20s thing, but the 90's will always have a place in my heart. I have wanted to be Jasmine for Halloween since the first time I saw Alladin 16 years ago (or however long it's been). I'm not sure why I didn't do it back then, unless it was an aversion to sewing and high prices. Now, I don't think anyone really wants to see that. Maybe next year (someday, maybe I'll stop saying that). I am not good at it, but I absolutely love performance. I love to be on a stage (or any arena) and perform and have people watch and clap. I used to be in chorus in middle/high school, but I didn't realize how much I loved being in front of an audience until the first time I performed in the color guard with the marching band in high school. It was an amazing feeling. I've had several jobs that involved public speaking. It doesn't bother me in the slightest - as long as I don't know anyone in the audience. I prefer to speak to a room full of strangers than give a speech to a handful of people I know. Maybe I feel like I won't be judged as harshly that way - or at least that strangers won't give me feedback. I'm really not sure why. Reynie - God, Do You Hear This Southern Girl Rambling? So I was perusing the internet the other day, looking at new (to me) mommy blogs, and following links, and I came across this nursing doll. I have to say I'm not sure what to think about it. When I was a kid, my Mama and Grandma made a nursing cat stuffed toy with little kittens that snapped on to nurse, and I always thought that was cool. I can see that it's educational for kids to have a human doll that nurses (although my memory of playing with dolls is that I was usually the mommy, and I didn't necessarily need to assign that role to my doll). The intriguing part is that the doll also gives birth (make sure to click on the additional photos at the link). I had two younger brothers by the time I was five (actually, one was born the week after my fifth birthday), and I do remember being interested in birth at that age. I was more interested in the pregnancy aspect, though. I remember thinking that babies came with accessories (almost all my dolls did) and wondering what different mommies got with their new babies (different dollies come with different baby items, after all). 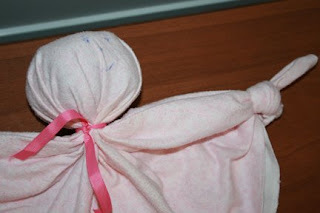 The doll's description states that it can be used by midwives, birthing classes, and other educational purposes. The doll was originally designed in Brasil to teach young girls about childbirth. It might even be a good way to talk about menstruation. I think the whole process would have made a lot more sense to me if I'd had, or even seen, a doll like this. It might have helped my Mama to have a prop when she was teaching me about being a woman. I've always thought that girls are expected to put down their dolls too soon. Perhaps this is a good doll to carry into puberty. So, what are your thoughts on the nursing/birthing mama doll? I was reading SuperFunMama's blog and she had an autumn to-do list. This is my favorite time of year but in Kentucky I've learned to dread it. I've never liked winter, and my experience in Kentucky has been short autumns and springs sandwiching much too long winters. As I mentioned in a previous post, my recent trip to my hometown reminded me of how much I love fall, so I thought I'd try to reclaim it with my own autumn to-do list. Make vegetable soup. I have a pretty constant "recipe" that I use, but since I plan to eat it a lot the next few weeks (low calorie, and I love this stuff) I'm thinking about switching it up a little. Go to Huber' Farm in Starlight, IN. Attend my high school reunion. I thought these were usually in the summer, but ours is taking place during our high school homecoming. I missed the 10th, so I'm looking forward to our 15th. Taking a in-the-leaves portrait of our daughter. I saw a really cool photo of a baby in leaves about eight years ago, and last year I just didn't get around to staging the photo shoot. So even though Abigail is a toddler now, I'll try to get it this year. Hot tea. I love hot tea, but don't drink it much. We just bought a sampler pack so I'm excited to try some new flavors. Eat candy corn. Well, I'm not having any trouble there! I'm always on the hunt for fall banana candy though. Make Christmas presents. We haven't discussed our Christmas giving plans with anyone we exchange with yet, but I might try to make a few gifts this year. We'll see. That's an ambitious goal unless I find a way to involve Abigail. Take Zumba classes. I took my first intro Zumba class Tuesday. It was again confirmed for me that I'm completely uncoordinated, but it was a lot of fun. I am not nearly as in shape as I would like. It's basically an aerobics class using elements of latin dance. I can't shake my bootie properly, but I really enjoyed the movements. Go to yard sales. I'm hoping to find more fabric stashes. We have plenty of baby clothes (and, in all honesty, probably plenty of children's books too), but I'm always interested in a good find. Make Abigail's Halloween costume. The funny thing is that I already bought Abigail's Halloween costume. It's a really cute ladybug costume that I found at a consignment store that was going out of business. 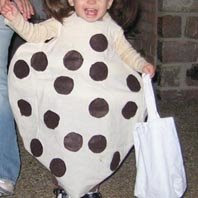 But then I saw what I thought was a chocolate chip cookie costume at Pottery Barn Kids (it turned out to be a giraffe costume), and I've become obsessed with making Abigail into a chocolate chip cookie. When I told the saleslady at Hancock's what I was doing, she asked Abigail if she knew that meant she was going to get eaten. Go to the Zoo's Halloween party. The Lousiville Zoo has a huge Halloween party every year. We've never been because we just didn't think Abigail needed to go at 8 months old and we didn't have kids before that. But this year we think she'll have a great time. The event is specially themed to NOT be scary so it's perfect for little kids. Make fall seasonal table. I've been reading about seasonal tables/displays on various blogs and in The Creative Family by Amanda Soule. I'm not sure if this will work this year. We may end up with pine cones and rocks all over the house, but it sounds like a good idea. Abigail is still little enough to try to put things in her mouth (including rocks), so I have to be careful of what I put out. Make chili. My husband and I make a pretty spicy chili (by my standards, at least), and it's really too hot to make during the summer. He's already started asking for it so we may make this in the next few days. We use chili hot beans, dark red kidney beans, lean ground beef, diced tomatoes, tomato sauce, and Rotel. We also throw in various spices and sometimes cocoa or cinnamon. Hopefully this list will help me get excited about fall this year. Although it will still be difficult to forget that it means another Kentucky winter is coming. Yes, I know it's not the worst place for winter, but I'm a Georgia girl, and I expect my spring to arrive my February or March. Ugh. Warren Sapp on Dancing With the Stars - I think now that Misty May-Trainer is out of the competition, Warren may be my pick for the season. He has the best attitude, he's versatile, and he can move. He's such a joy to watch. So often the ones that are the most fun to watch (like Steve Gutenburg) simply can't dance and don't last that long. Warren has the potential to go far, I think. Fall in Georgia - I always loved fall, but since I've lived in Kentucky I've gotten sad each year around September and stayed there until March. Winter starts around late October in Kentucky, and spring doesn't come until late April (if we're lucky). Then it's heat and humidity for the rest of the summer. Being in Georgia more this fall has reminded of what I love (since fall in Georgia actually lasts more than a week or two). The air is cool and crisp, the leaves are crunchy under my feet (so what if it's because of the drought this year - at least it wasn't humid), and there were pine cones everywhere. I miss fall in the deep South. Candy Corn - I'm a big fan of candy, and "seasonal" candy is so much fun. This year I've discovered Chocolate Caramel candy corn and Caramel candy corn and they're a refreshing change from the regular kind (which I still love). My favorite candy corn, though, is in the bag marked Harvest Mix from Brachs (and some other brands). It's filled with fall shapes in candy corn, chocolate, maple and banana flavors. Love that stuff and it's SO hard to find. This year is the first time I've seen it in at least 3 years. Vegetable Soup - My mom and I used to make huge pots of vegetable soup and pans of cornbread and eat on it for days. And when it was all gone, we'd make another. Sometimes we'd make a batch in the summer, but we usually didn't start until fall. Today was the first time I've made veggie soup in months, and it was so good. I'm very strict about the lack of meat - it's vegetable soup after all. My secret ingredient? Rotel diced tomatoes and chilies. I like spicy soup. Language Acquisition - Abigail seems to be learning several new words a day now and it's so much fun. In the past week, she's learned cow, plate, soup, swim suit, silly, and a few family names. Words are so cool! Yard Sales - I'm not usually a yard sale girl, but we went to my mom's neighbor's sale over the weekend. Not only have I known the family since before I have memories, but this was that rare yard sale with fabrics and antique linens. I picked up yards of fabric for quilting and general fun and one linen pillowcase. Now I'm regretting not getting more of the pillowcases and tableclothes. There's a huge neighborhood sale this weekend that I'm really looking forward to canvasing now. I've been reading in various toddler books about letting my baby help me cook. I felt guilty at first because not only do I not do most of the cooking at my house (I have a wonderful husband who is a great cook), but our kitchen is small, and Abigail is pretty busy. I have visions of vegetables and water all over my floor (one suggestion is to let the baby wash vegetables at a toddler table). One evening a couple of weeks ago, she was running around under my feet while I was trying to cook dinner, and the answer came to me. I realized all our canned green beans were in the basement, and asked Abigail to help me get them. She even got to carry one can up the stairs by herself. Once I'd opened the cans, I picked her up, and asked her if she wanted to help Mommy cook. So I let her hold the can (I held the can too as a backup) and we emptied both cans into the pot. Then I got out the seasoning (we use a roasted garlic seasoning from Tone's) and I let her help me shake that into the pot too. She was so proud of herself that she calmed down while I finished cooking everything else, and told her Daddy about her adventure when he came in. She's just getting to the stage where she tells "stories" soon after they happen (if prompted), so the whole experience was exciting for all involved. Abigail is 20 months now, and I'm still searching for fun things to do with her that won't leave us both feeling like we weren't ready for the experience yet. Cooking with Mommy was a hit though, and Abigail just got to make her second batch of garlic green beans. I discovered freezer paper stencils on SouleMama a few months ago. It was an old post, but I just discovered her blog in May, I think, so I explored her archives for a while. I really wanted to try doing it, but hadn't gotten around to it. Once her book The Creative Family finally arrived at our local library (about six weeks after I initially requested that the purchase copies), I couldn't stand it anymore and went in search of freezer paper. I didn't think freezer paper would be that hard to find, but our local SuperWalmart didn't have it, and our former IGA grocery did. Yea for local country stores! I had located some clearanced canvas bags at Michaels (very cheap - 50 cents but several shredded in the wash), and thought they would be perfect to try this technique on. I was a little apprehenive about trying my own designs, and I really wanted to put my daughter's name on her toy bag we take in the car. As a scrapbooker, I have many alphabet stencils, so I just traced her name using the stencil. After I traced the stencil, I c ut it out with my craft knife. It was a little tricky because with letters you do have negative space to think about. I placed the stencil where I wanted it on the bag, then placed another piece inside the bag (I think this keeps the paint from soaking through). Then I ironed the stencil, making sure that the little dots inside the As and Gs stayed in place. Once I was sure the stencil was stuck to my fabric, I used fabric paint to get my design. For the Abigail design, I used Tulip Soft fabric paint in white velveteen. 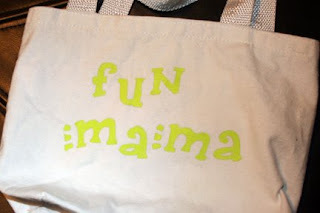 For Fun Mama, I used Tulip Soft fabric paint in Lime green matte. 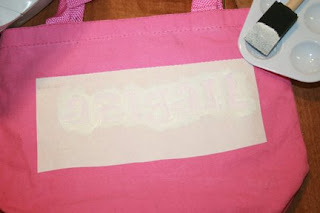 When the Abigail bag was dry, I pulled up the stencil and then used my heat tool to "puff" the paint. The great part about this project is how simple it is. I pretty much got the whole thing done during naptime. In addition to the directions I found in The Creative Family and on Angry Chicken, there were also directions on the freezer paper box and of course the paint bottle. I'm pretty happy with the results. I also painted a bag for me with my blog name in my current favorite color: lime green. I've gotten compliments from people who don't "get" crafty things at all. I think this is a great project to do with older kids, maybe five and up, but painting only. There's a hot iron involved, and you just wouldn't want to do that with kids. I could let Abigail do the painting part, but I'm thinking at 19 months most of the paint would end up in the "wrong" place. Painting is not about finished product at her age. I'd rather just hand her some paint and a bag and let her do what she wants. I might try that, actually. I've been doing some "research" into the Waldorf method of education because one of my favorite current books is The Creative Family by Amanda Blake Soule and the reviews I've read of the book referenced Waldorf. I'm interested in how it's different from Montessori education. This interest is largely academic because the likelihood we'll homeschool our daughter is small. I have some issues with standard education, though, and plan to at least supplement her education. And I'm her only teacher right now. My problem is that my local library doesn't carry any books specifically about Waldorf education. I did read a book on starting Montessori education from birth and I found that it works against my attachment parenting beliefs - at least for infants and toddlers. What I have managed to gather about Waldorf education is that the first seven years are sacred and that children should be free to use their imaginations. Having lots of electronic toys that only do one thing is discouraged. So far, so good. I've also learned, though, that even dolls shouldn't have much of a shape until children are about 5 or 6 and they shouldn't have faces. I'm not so sure I agree with that theory. I grew up loving dolls and I still collect them when given a chance. My mama and grandma made dolls both for my cousins and me and to sell. I've tried making a few dolls and I've never gotten very far, but now that I have a little girl I do intend to try and succeed. To that end, I checked a book out of the library called Toymaking With Children by Freya Jaffke. The first few chapters are an explanation of the Waldorf play theory and what ages to introduce different kinds of toys to children. For instance, animal toys "should not" be introduced to children under three. The reasons for this have to do with the development of imagination and creativity, which I'm all for developing. I'm just not sure that it's realistic that my child wouldn't have toys that were representative of animals by birth (I can't count the number of stuffed animals we already had by the time I was seven months pregnant - that had been purchased for us). I'd hate to see what the author thinks of our large collection of hand-me-down toys (which, admittedly, even I'm overwhelmed by). One of the suggested toys for toddlers is a large knotted doll, and there are instructions in the book on how to make one (confusing instructions). The directions call for a large square of soft fabric, stuffing for the head, and something to tie the head with. I do have a collection of fabric but haven't sewn in years, so it's still boxed up from our last move. Then I remembered the ridiculously large collection of baby blankets I have, and found a wonderful pale pink square flannel receiving blanket. My child is a furnace so it's unlikely that she will need flannel in the near future. I didn't have any stuffing (the author recommends raw sheep's wool but I didn't have any of that hanging around either). Then I remembered the box of my husband's holey socks that I keep for dusting. Two of those rolled up together made a great head, which I tied with a pink grosgrain ribbon (scrapbooking supplies come in handy all the time). You put the stuffing (socks) into the center of the square, pull up the corners, and tie the ribbon around the "head." Next, you tie a knot in two of the opposite corners for "hands." You can also pencil in eyes and a mouth (I used ball point pen because I had one within reach). The book indicates that the mommy needs to show love to the new baby doll for the toddler to understand what it is and to love it herself (or himself, because we are all about boys playing with dolls too). Well, I've tried showing love to this doll, and my daughter does snuggle it for a few minutes, but she is showing a definite preference for the baby doll with the plastic head and hands and a real face. In an effort to get her to appreciate it, I let her take it with us when we went out to dinner with friends. She's not allowed to have her plastic handed baby in the car because she chews the hands and feet and we'd rather her not do that. I thought if she was allowed to have the new doll in the car that would endear it to her. Unfortunately, she needed a nap so she threw the doll on the floor and conked out until we reached the restaurant. I was so impressed with my ingenuity, though, that I let her take the doll inside to show to our friends. Our friends were less than impressed, though. The doll has now been dubbed the "creepy octopus ghost" and I don't believe it's going to be invited back to dinner. Abigail will hardly play with it now, either, and I'm not sure that she's affected yet by the opinions of others. This is just my first attempt. I'm researching doll kits and doll patterns. We'll see what happens. I found the Magic Cabin website when reading The Creative Family by Amanda Soule (I think). I requested a paper catalog because the website seemed more like an idea resource than a toy store. The catalog was in Monday's mail and it is so much fun to look through. It kind of reminds me of the fun catalog I read in college with the capes and safari hats and fun descriptions of how the products were obtained (I cannot remember the name of the catalog though). Magic Cabin has illustrations instead of photographs and the same classic feel to its products. The company sells toys, books, games, and craft projects that appeal to children's imaginations. They sell mostly cloth and wooden toys. There's not a lot of plastic and I don't see anything battery operated. That's refreshing these days. What I like about the catalog is that it gives me so many cool ideas of things to make for and with my kids. I know that the intent of a catalog is to sell things, and there are many things in this catalog that I can't make. 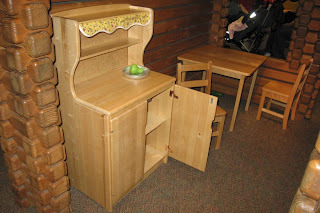 I'm intrigued though by the idea of making dollhouse furniture out of pieces of fallen branch. Of course, not everyone has falen branches or the tools to do something with them (or a brother who might be willing - Andy, are you reading? ), but if you are so inclinded some of the ready-made products might not be too difficult to create on your own. Of course, I'm also sure that even the creators of the catalog don't intend everyone to buy everything in the catalog. One of the coolest things on the website (I don't see them in the print catalog) to me is the doll kits. Magic Cabin sells several Waldorf style dolls (it was originally a doll catalog), and they seem to have a doll making kit for most of the dolls they sell. My Mama and my Grandma made dolls for me and my cousins growing up, and I'd love to start making dolls myself. And they sound so cool to make. The fact that they're described as for ages twelve and up makes them sound doable for this sewing novice. Until I get my sewing machine into my house (and perhaps have someone show me how to use it again?) this is a pipe dream though. Until then, I will look through the catalog and figure out my wish list for my girl. Today we had our first real in-home playdate. We've gotten together with friends at the mall or the gym or the library before. We've even gone to a friend's house to play. Today, though, was the first time we had someone come to our house during the week just to play with Abigail. It was kind of a last minute decision, and we kind of had a bad night last night, so I wasn't sure what to expect. My new friend has two toddlers of her own, though, so I wasn't too worried about mommy-judging. All in all, though, we had a good time entertaining our friends. And I'm thinking a little front yard picnic may be just the thing for breakfast and lunch on occasion. Maybe I'll invite the neighbors next time. I checked Baby Days by Barbara Rowley out of the library several weeks ago, and I'm so sad that I have to return now! There are so many interesting things to read in this book that I haven't been able to appreciate it all. I've seen reviews of several activitity books for toddlers that insist those books aren't helpful because the activities are things you can think of for yourself. While it's true that I'm a pretty creative person and can think of all kinds of things to do, I am also exhausted most of the time these days and that's not the best condition for thinking of fun things to entertain a toddler! It's arranged by the course of the day, not the course of the year. It includes activities for babies (under 18 months) - not many, but at that age you don't need a lot of different stuff. Each activity has a rating on the messiness quotient. Arrangement: Most of the activity books I've looked at are arranged according to the season of the year. That definitely has it's place - I do believe in following the seasons and paying attention to nature that way. However, I don't believe that it is practical or necessary for very young children to do crafts or activities based on Valentine's Day or Halloween. I'm not talking about dressing up in fun costumes, but about expecting small children to do heart shape related crafts when all they really care about it playing with crayons and glue. Not to mention the fact that at this age, sometimes it's all you can do to think what comes next during the day. So the fact that this book's chapters include Mornings, Naptime, Afternoons, Mealtimes, and Bedtimes really works for me right now. Baby Activities: Part of my obsession with craft and activity books is that I have fond memories of doing things with my mom when I was little. Since my daughter is so young and unable to do elaborate crafts with me, sometimes I start wishing she'd grow up a little so we can do more fun stuff together. That's a slippery slope, I know, and I'm really enjoying the toddler phase. I know it doesn't last, and I hate the thought of wishing it away. So I'm glad that this book has suggestions for how to adapt activities to different age levels, include siblings, and do fun things with babies before they can do many "fun" things (of course, it's all fun). Messiness Quotient: I believe that it's very important for babies and small children to have the opportunity to get messy. It's part of learning to be able to squish gooey stuff between your fingers and toes, and I love being able to provide that experience for my daughter. However, messiness is not always practical if you need to be somewhere, or you need to cook dinner and provide entertainment. So it's nice to see at a glance things you can do that are very messy or relatively clean. Play Footsie: providing textures for a toddler to walk through such as flour, uncooked oatmeal and cooked gelatin. There's also a non-messy variation. Be A Big Dipper: I've heard this before - kids are supposedly really into dipping things. This gives a list of things that can be dipped and what to dip them into. Anything to get a kid to eat veggies, right? Decorate the Meal: letting the toddler garnish the plates like at a fancy restaurant. Anything that makes the food fun visually can help convince a child to eat (if not right away, perhaps overtime). Keep an Informal Parenting Journal: I actually do this at night before I go to bed, which can be a problem. Even if I'm not too tired, often I've forgotten the cutest stuff. Make Old Toys New Again: This suggests to move toys around in the playroom. I actually switch them out completely, keeping the spares in dish tubs in her closet. Be Ready for After Nap Crankiness: I'm always caught off guard when she wakes up cranky. She went to bed cranky - shouldn't getting some sleep HELP with that??? Ideas from this book include storytime and having a project ready. Silliness: This might be the number one solution for every problem. I just have to make myself remember it. I have a tendency to get frustrated when we're both hungry and she can't tell me what she wants. If I could just remember to pretend to fall down, would that make everything better? Make a fort: We did this all the time as kids, and I've done it for Abigail a few times already. Everything seems fun inside a tent. Paint Your Belly: For babies, you paint and for toddlers they paint. Or you paint. Even in the tub I'm not sure about letting her loose. Paint your Nails: Using baby safe paint, paint baby's nails before bath. Massage: for after bath - although this has never worked as well as promised for me. Help Baby Keep a Diary: This is a habit I'd like to start young. I think it's important to have a record of our days. There are also chapters on outings, travel and special events. The book is subtitled Activities, Ideas and Games for Enjoying Daily Life with a Child Under Three. I think it's a great book for those"what are we doing next?" moments, and I intend to get my own copy soon. I think it would be helpful for any mom who sees herself in these moments more often than she'd like. I've been so caught up in the Olympics that all other news has gone right past me during the past two weeks. So I was shocked and excited when I found out that a team of researchers found 100,000 gorillas living in Congo. I thought this was so cool that I just had to share. We were able to get to the fair a second time this year, and just got back a few hours ago. I have a confession to make. Post-kid, it seems that pineapple whip is still one of my favorite things about the fair. Although the look on her face when she saw a cow up close this afternoon was pretty cool too. I am a huge Stacy Julian (Big Picture Scrapbooking and Simple Scrapbooks) fan. Her philosophy has influenced the way I scrapbook for almost 8 years now. So I was excited when she came out with a mini-scrapbook kit in June as part of CK Media's Kit of the Month. I have not had an opportunity to purchase one yet, but I hope to get one soon (not many left, I hear). Anyway, Kerri Bradford is giving away 2 of Stacy Julian's Penny For Your Thoughts kits this week on her blog. You have to hurry, because she's drawing names on Thursday morning. Growing up, I didn't get to go to a lot of fairs. The state fair was several hours away, and the county fair was on the opposite side of the county and we couldn't get over there after school. So the Kentucky State Fair was surprising to me the first time I experienced it in August 2000. For one thing, it's huge (one of the largest in the country although I don't have stats). There are all kinds of animals, a huge horse show, competitions in all kinds of home and fine arts. I've always had so much fun going to the fair, but we had to miss it last year because we were out of town. This year was the first time we got to go as a family, just the three of us. My husband took the day off work on Friday and we spent 9 hours walking around the fair (19,750 steps according to my pedometer, if you're interested that's 6.23 miles!). Fortunately, our girl is pretty good at taking naps in her stroller and will eat just about anything we give her. My favorite parts of the fair pre-kid were the quilts (I've always wanted to quilt), the decorated cakes (my mom is a fabulous cake-decorator) and the pineapple whip. Pineapple whip is this ice cream-type concoction but it's non-dairy. It tastes like soft-serve pineapple juice. I love it. I understand that it's sold in Magic Kingdom at Disney World but other than that I don't know where to find it. My favorite parts of the fair post-kid? I love how educational the fair is! I never noticed it before, even when I was there with my niece and nephew. Abigail got see so many things that we don't see on a daily basis. There was llamas, alpacas, donkeys, goats, rabbits, chickens, turkeys and a few other farm animals I've forgotten about. We live in the country and there are ponies, horses, goats and chickens viewable from our front and back doors, but she's little and can't see them as well as I can. And she's never had the opportunity to pet our neighbor's goat. We also got to see baby chicks because there is an incubator in one of the exhibits. Abigail is too young yet to appreciate some of the exhibits available. Kids have the opportunity to explore emergency vehicles, and to speak with police officers in a celebratory atmosphere. There was an exhibit about the Kentucky Proud program, which helps local farmers market their goods within the community. Kids (and parents) could not only learn what kinds of goods are produced in Kentucky but how it serves our community to buy local. A lot of local farms allow visitors which I think is so fun. I've been looking into visiting a sheep farm in the area not only to see the sheep but to buy some wool. The collective is called Kentucky Farms Are Fun and I'm so excited about this venture! I believe that it's very important that we as a society understand where our food comes from and how it's grown, and I don't believe that kids today grow up understanding it very well. While our family (and the families we were raised in) do garden and I know our children will have that exposure, I am still grateful that there are resources like the fair for our children to experience some part of agricultural life. I am so glad that we have the opportunity for attending the fair to be part of our family traditions and I hope we continue this tradition regardless of where we live. So my suggestion is to look into your local fair, county or state. There is often so much more to the fair than the rides and the food. Rosie O'Donnell's Crafty U came out in April 2008, but I've been living under a rock because I didn't know about it until a few weeks ago when I came across it at Michaels. It's a very good looking book with great photographs of the competed projects. I checked it out at the library to see if it's a resource our family needs. I do really like the book, but the target audience is older - at least preschool. And preschoolers would need a lot of help from an adult to do these projects. Of course, the point of the book is together time with your kids, so that's not really a problem. I am interested in purchasing this book when Abigail gets older. This is yet another book that is arranged seasonally. I'm not sure why so many craft books do this. Sometimes it seems to be an artifical method of sorting projects. Yes, there are projects that just scream "seasonal" like dying Easter eggs (decorating Easter eggs is actually one of the projects) or creating soapy snowmen, but a lot of the projects can be adapted to any time of the year. There is one chapter at the end for "rainy day" activities that use common household items and are not tied to any season. I knew I wouldn't get to do any of the projects with Abigail for quite a while, so I made a list of the projects that I most wanted to do along with the page numbers. Now, I just have to hope that this book doesn't go out of print before I'm ready to buy! So, while I have seen several of these projects in other places, and even Rosie has said that the pictures do not represent reality (the photos show projects completed by adults, not kids), I still really like this book. I really believe that crafting should be a source of family memories - good ones - and should become a family tradition over time.